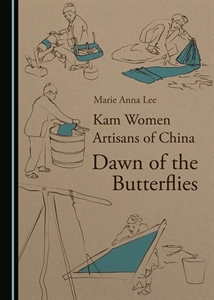 ‘Kam Women Artisans of China: Dawn of the Butterflies’ by Marie Anna Lee published by Cambridge Scholars Publishing, Newcastle-upon-Tyne, 2018. ISBN 978-1-5275-0553-7 289 pages, A5 size, Price: £76.99. Deep in the fir woods of southwestern China, in a village called Dimen, live several women who are masters of many cultural arts. Following the centuries-old lifestyle of their ancestors, they are the living repositories of their civilization. They carry the unwritten history and wisdom of the Kam people in their songs, weave cloth that is smooth and strong, and dye fabric to the richest indigo blue. They devote every free moment to embroidering sleeves, hems, hats, and purses in the bright colors of the natural setting that surrounds the village. 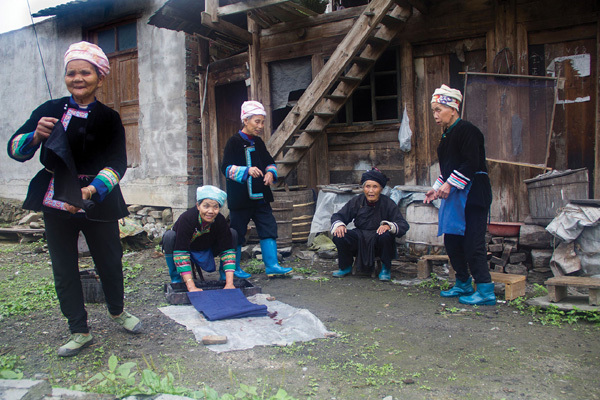 Through everyday activities, lessons in craft, folk stories and songs, the women weave a patchwork of Kam culture and reveal its hidden treasures in fibers, textiles, papermaking as well as ethnography, anthropology, and Sinology. This book presents an opportunity to learn from the past long lost in Western tradition, explore contemporary rural life in China, and experience ancient culture metamorphosing under the pressure of technology. Marie Anna Lee is an Associate Professor of Art at the University of the Pacific in California, USA. She has worked on the cultural preservation of Kam indigenous heritage since 2007, and received the 2013 and 2014 SEED (Social Environmental Economic Design) Award honorable mention for excellence in public interest design for her work in Dimen. As part of the Kam delegation from Dimen, Lee presented at the Smithsonian Folklife Festival in Washington, DC, in 2014. She taught at the Public Interest Design Institute in Denver in 2013 and presented her research at numerous national and international conferences, and has co-authored multiple articles in global monetary history. She has also exhibited her art in the USA, China, and the Czech Republic. Lee holds a BFA and an MFA in Graphic Design from Colorado State University, USA, and a BA in Advertising from Michigan State University, USA. This book seeks to document the culture of the Kam – or the Dong as they are known to the Han in China and, indeed, very much more widely – as it relates particularly to textiles, dress and paper – see extract for Contents. I think that the author’s determination to use ‘Kam’ throughout the book and especially in the marketing summaries, with only a couple of references within the book to: “known as Dong to the majority Han Chinese”, will miss attracting the attention of those with an interest in the group and will restrict sales. There is a fair amount of specialist literature available in the international marketplace covering, or with references to, the group and they are almost always referred to as ‘Dong’ as indeed they are in the title of the museum in Dimen referred to in the next paragraph. The book is expensive at £76.99 for an A5 size volume and this is likely to further limit its buying audience. The book is set in the Kam village of Dimen in the mountains of Guizhou in South West China. The village is about 7 miles from the nearest road and started to open up communications with the outside world in the 1980s and 1990s. In 2004 the Hong Kong scholar, publisher and entrepreneur Lee Wai Kit founded the Dimen Dong Cultural Eco Museum with the aim of studying and preserving Kam/Dong indigenous culture. The author, then based in HK, visited Dimen three times between 2007 and 2009. Taking up a faculty position at University of the Pacific in Stockton, California she then arranged trips of a month in 2010, three weeks in 2011 and a brief visit in 2014. The aim of these latter visits was to learn by doing a range of crafts from papermaking to weaving, dyeing, embroidery and garment making. Key to this learning and core to the authenticity and the charm of the book is the group of five elderly women – za (a term of respect in Kam for elderly women) – who agreed to teach to the author and one or two colleagues a range of skills in the midst of their myriad duties including the care of grandchildren, farming and so much more besides. The reader gains huge respect for these matriarchs who work from sun-up to sun-down rarely complaining: “The za have little but lack nothing.” “Through stories, songs and personal example, the za weave the centuries-old Kam culture before our eyes.” Each of the za is presented in Chapter 3 with their personalities further emerging as the documentation progresses and they are shown in the many colour photographs illustrating the tuition they provided. The za’s joy and pride in their proficiency comes through in the text. We see the za working together to achieve success on projects. Some may be more skilled at a particular technique than others but all can and do ‘have a go’. Many of the techniques require working together. The pooling of efforts; the getting fun out of working together; any excuse for singing; are all part of the daily life and cultural background of the za which underpin the teaching process. Lee did not want to obtain snapshots of different parts of production. Her requirement was to learn by doing each technique of each craft, i.e. an apprenticeship, and working through each stage in the production rather than just watching, photographing or filming certain aspects of the process being demonstrated by local experts. This was unusual for the za who, when the opportunity arose, had a tendency to complete parts of the process to move things along more quickly. The author’s determination to learn by doing every part of the production really does give a sense of the very long process from thread to garment and the huge amount of effort and determination required. The multitude of precise stages in the preparation of a skirt is particularly telling in this respect. I found the process of dyeing fascinating. I was aware of the general concept of indigo dying but the detailed stage requirements re the skirt were fascinating. The application of the red over-dye which gives a purplish hue and sets the pleats was very interesting and not something usually explored especially in such detail. Having myself visited several Kam/Dong villages in 2005 I can tune into the atmosphere of the book, especially the joy that the za take in singing which is so core to their culture and its communication to others. My respect and appreciation for the Kam/Dong has led me to focus on many aspects of their craft skills in my own collecting over several years. I have watched various techniques being demonstrated so I had a background to the detailed descriptions in the book. However, I am not sure that I would be able to turn my hand to actually executing each technique from the descriptions given by the author – in words, diagrams and photos – albeit that these are both numerous and detailed. There is mention, however, of video having been shot during some of the visits to the village which could give support to the written documentation and together provide a useful record for the Kam of Dimen of the specific ways of executing various crafts in the tradition of their village. I found that the volume very much enhanced my understanding of the Kam/Dong and the crafts which were so much part of their everyday life. I was, however, disappointed to find several minor editing errors in the book which would have benefited greatly from a final rigorous read through to pick up errors from previous edits which left behind duplicate words and phrases. Nevertheless, this should not be allowed to detract from the overall worth of the book. Lee definitely does justice to her teachers showcasing their wide range of technical and life skills all wrapped up in their zest for life supported by and illustrating the culture from which they come. So much has and is changing in the za’s lifetimes. Documenting these indomitable ladies is as important as detailing the skills of which they are such skilled exponents.